Grain will eventually reach the moisture levels shown in the tables when exposed to the corresponding temperature and humidity levels for long periods of time. This can occur in the field or in the top layers of a low-temperature bin dryer. Drying time will depend on the airflow rate through grain, which in turn depends on the depth of grain in a bin. The minimum drying rate for natural air drying is 1 cfm/bu, but this can take up to a month to dry the top layer depending on the grain and air conditions--during which time spoilage can occur. A grain moisture chart was just updated for producers this fall. Dr. Sam McNeill calculated the Equilibrium Moisture Content (EMC) for corn, soybean and wheat. The charts identify the moisture that each seed will approach at a certain air temperature and relative humidity. For example, corn will approach 11.3% moisture content at 70 degrees Fahrenheit (21.1 degrees Celsius) and 50% relative humidity. Soybeans will approach 8.8% moisture content at 70 degrees Fahrenheit and 50% relative humidity. Click here for the EMC chart. Many soybean fields around the Commonwealth have green stems and brown pods. The seeds are mature, but the stems are not. This occurrence is commonly called “green stem syndrome”. The green stem syndrome is a nightmare to harvest as the combine tries to handle dried plant material and wet plant material at the same time. Seed moistures from plants with green stem and “normal” plants can be different, further complicating harvest. At times, combines can gum up from the green tissue. Green stem syndrome occurs when the soybean plant does not set enough pods to match the supply of sugar and nitrogen coming from the leaves. Stopping seed growth early also can be a factor. Sugar and nitrogen made in the leaves travel through the stems to the developing seed. When the supply exceeds the needs of the seed (i.e. not enough pods), the sugar and nitrogen accumulates in the stems and the stems will stay green until a hard frost or freeze. Fall Armyworm Moth Flight – Has begun to drop, but still plenty around! The second flight of fall armyworm (FAW) has begun to drop as indexed by the UK-IPM pheromone baited trap in Princeton, KY. 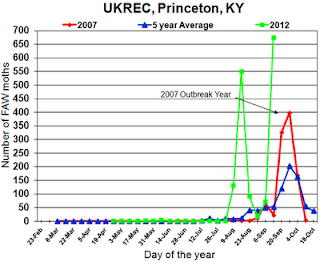 Nevertheless, the capture for the trap-week ending Sept. 20, 2012, is still greater than the peak capture during the outbreak of 2007. (See Figure 1.) So, hopefully, we are on the downhill side of this problem, but there will still be plenty of moths to lay eggs over the next couple of weeks. Producers, consultants and farm service personnel are still calling to report infestations and ask questions. There does not seem to be much problem with obtaining control once an infestation is found, but many folks are still not finding the infestations until considerable damage has already been done. Certainly, most callers are interested in what is coming next. Although the moth capture gives us a heads up and an indication of the level of risk, they will never tell us what is happening in a given field. Our current weather may tend to extend the time the caterpillars are present. Our cooling temperatures are not cool enough to hamper the worms, but their development may slow down, increasing the days they will be in the damaging stage. The crops at risk remain the same. Grass crops (pasture, hay, lawns) still remain in danger. Still, soybean problems appear to be coming from the caterpillars “marching” out of grasses in to the beans. Don’t neglect to check a field interior now and again. FAW will lay their eggs in soybeans, but grasses are by far the preferred egg laying site. Anyone planning to plant wheat, rye, or renovate / restore any “small” grass pasture or hay field should give strong consideration to waiting for a while longer to seed. Experience tells me FAW caterpillars will be around until frost, even if not in the large numbers present now. Fall Armyworm Moth Counts Continue to Climb! Capture of fall armyworm (FAW) moths has increased for the second week in a row, and this week by a huge margin (Figure 1.). Not only has an unprecedented second distinct FAW flight begun, it has surpassed this year’s previous peak in size. The August flight which reached 549 moths / trap-week for the trap-week ending Thur., Aug 16th, now stands at 675 moths / trap-week for trap-week ending Sept 13, 2012. Will it go higher? Only time will tell. In addition to the numbers of FAW moths being captured, there is a second situation that gives me pause. This 2nd flight peak will be earlier in the season than we normally see, if one occurs. If the current numbers turn out to be the largest capture, then the peak will be approximately two weeks earlier than we would normally expect. Putting this in perspective, if we have an average frost date of Oct 22nd , this flight has approximately 5 ½ weeks for the caterpillars to develop and feed on our crops as opposed to a more normal 3 weeks. If frost is late this interval could be even longer. Remember, the graph above represents MOTH flight. Moths are not the damaging stage of this insect. These moths were captured because they were seeking female mates. Once mating and egg lay has occurred, we will begin to see very small FAW caterpillars. This is the beginning of the damaging stage. This will likely take a week, perhaps two, depending on temperatures. Of course, further south and west (toward the upper Mississippi River bottoms) caterpillars will appear sooner. Further north and east (in the western 1/3rd of KY), caterpillars will take longer to appear. Fortunately, the traps in Lexington have just this week captured FAW for the 1st time this year; and the numbers are small. I doubt that there is any unusual risk in central and eastern portions of our field crop / pasture-hay production area. Remember, as well, that these trap counts will NOT predict what will happen in an individual field. There is really no easy way to detect the presence of this pest. One must go to the field and look for their presence / activity. I would start by sweeping in grasses that have received enough rainfall to start re-growth. This will be a preferred egg laying location. FAW will lay eggs in soybeans, but they are not the preferred host. If this generation acts like the last, most soybean infestations will start with worms moving from grass waterways, roadsides & pasture/hay fields. Crops primarily at risk will be newly planted wheat, pasture / hay production and very late maturing soybeans. There is really only one thing that can bring this cycle to a halt….cold weather. FAW is a tropical insect that cannot overwinter in KY. In fact, under historic conditions, FAW cannot overwinter outside the gulf coast areas. So, vigilance will be needed until a hard frost stops their northward migration. Certainly, this is not the year for early planting of wheat. for the article: “The Effect of Insects on Wheat Planting Decisions” for a more complete look at FAW and other arthropod pests on our upcoming wheat planting season. The Worst Drought Since the Dust Bowl, but Where is the Dust? The 2012 Drought left Kentucky corn in tatters, but the soil is mostly intact. The 2012 drought rivals the droughts of the 1930's, or the "Dust Bowl". But, there is one major difference in the drought of 2012... there's relatively no dust. I remember my grandfather talking about the Dust Bowl and saying that he couldn't see the sun for days. He lived in southeast Ohio, yet some of that soil he saw in the sky was from Nebraska, Kansas and Oklahoma. We certainly see a very different story today. While there have been reports of massive dust storms in Arizona and similar desert climates, there has been relatively no evidence of dust storms in the Midwest in 2012. So, if our 2012 drought is similar in size and intensity to those of the 1930's, what happened to the dust this time? Mycotoxins, and specifically, aflatoxins are a concern in corn this fall. There are some reports of harvested loads of corn being rejected because of high levels of mycotoxins. There are a lot resources to discuss sampling, testing and feeding of corn with mycotoxins. We have put those items together into the Drought 2012 page on the Grain Crops Extension website. 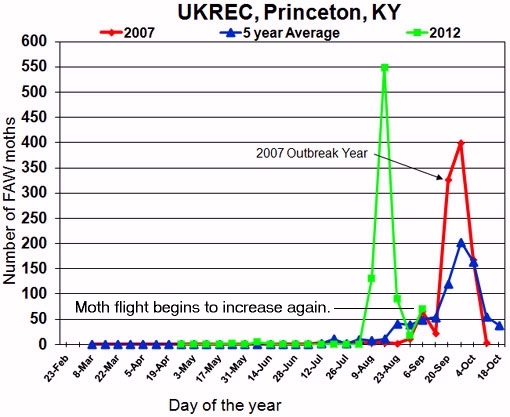 Fall Armyworm Moth Flight Numbers Begin to Rise Again. The number of reports of fall armyworm (FAW) infested fields has slacked off for the present. Unfortunately, I do not think this problem is over for the year. I believe our IPM pheromone- baited traps are supporting this notion with an up-tick in captures this week. Notice up-tick in green line. If we look at the FAW moth captures for the year so far (Figure 1. ), we can see three telltale signs. All three of these may be found in the relationship of the 2012 flight (Green line) to the 2007 outbreak population (Red line) and the rolling five-year average (Blue line). 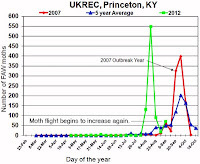 The 2012 flight of moths is: 1. much earlier, 2. much larger, and 3. appears to be starting to climb, indicating a second moth flight. None of these is absolutely definitive that we will experience a second economically important worm population, but they certainly indicate that we should be watching for one. That certainly seems to be the opinion of my colleagues in states to the south of us, and they experience FAW more often than do we. We will not know until we see the moth flight numbers for the trap week ending Thursday, Sept 13th, or perhaps even the trap week ending Sept. 20th whether or not we have a second and threatening population. To my knowledge, there is no precedence for this in KY. Certainly we have seen FAW linger until frost, but we have not seen them do this in widespread large numbers. When viewing these graphs, please remember that you are looking at moth capture. Moths are not the damaging stage in this insect. Moths (adults) are simply responsible for reproduction, dispersal, and egg lay. The resulting worms (damaging stage) will appear after a 1-2 week delay from the moth flight. for a look at the possible impact of insects, including FAW, and mites on the 2012 wheat crop. for Insect & other pest considerations and agronomic information related to the 2012 planting season. 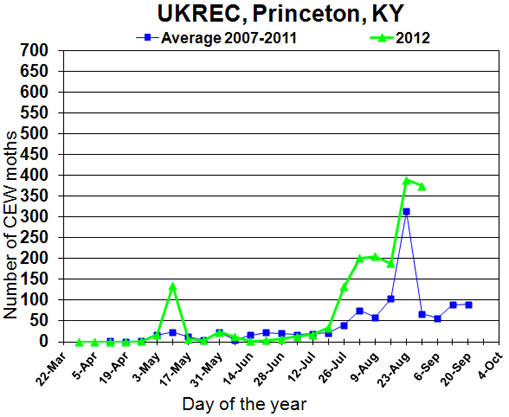 Capture of corn earworm moths in IPM pheromone baited traps at UK-REC, Princeton (Caldwell Co.) Ky in 2012. CEW caterpillar and damge on soybean. Corn ear worm (CEW), also known as soybean podworm, are currently active in soybeans. This is a direct damage pest as it feeds on pods, seeds, & petioles. You are unlikely to detect this pest by checking for defoliation because it does not feed much on leaves. There is no sure way to detect this pest in your soybean crop except to scout for it. This means sweeping or direct visual examination of the pods. CEW may occur in many color phases. It sometimes appears very dark, almost black, to brown to red and green. The green color phase is most often seen when feeding in soybeans. When fully grown, the larvae are about 1 ½“ long. They are marked by alternating light and dark stripes running the entire length of the body. These stripes are not always the same from one caterpillar to another. Usually a double dark stripe will run down the middle of the back. You can certainly look for direct damage feeding on the pods to see if they are causing damage. In rows narrower than 30”, sweeping with a 15” sweep net is about the only way to measure this pest. The threshold is 9 worms per 25 sweeps. We do know that corn earworm moth flight has been increasing and populations are greater than we normally see. Moth capture in our IPM pheromone baited traps at the UK-REC in Princeton is shown in Figure 2. Remember, these are moth counts and moths are NOT the damaging stage. Caterpillars will appear about a week after the moth flight. 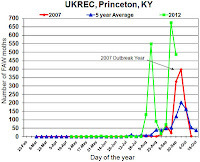 In 2012, moth numbers (green line) are greater than the rolling five- year average (blue line) so we are at an elevated risk of damage from this pest compared to most years. However, trap captures will NOT tell you what will happen in an individual field. Only field sampling will help you establish whether or not a threshold has been met. Moth flight numbers will give you a week or two heads up on what might happen. If insecticide control is warranted, you may find products listed for control of CEW in soybeans online at: http://pest.ca.uky.edu/EXT/Recs/welcomerecs.html or from your County Extension Office. Be wary of spraying too early, you may kill the predatory insects that are providing some natural control and miss the actual pest. Figure 1. 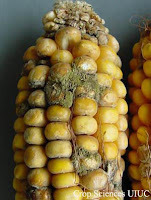 Typical symptoms of Fusarium ear and kernel rot. scattered kernels or groups of kernels, as shown here. 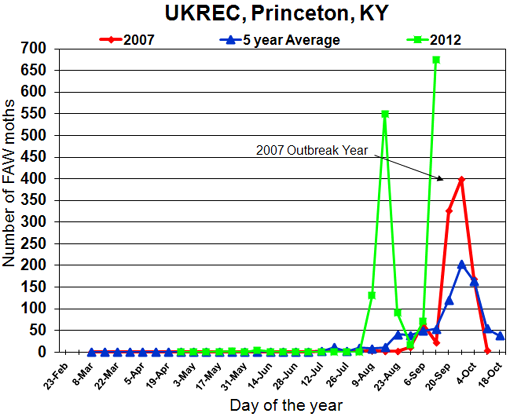 The content of this article previously occurred in the Kentucky Pest News, number 1315. Pre-harvest contamination of corn with fumonisins is a possibility in some lots of this year’s Kentucky corn crop. Fumonisins are a family of mycotoxins produced by the fungus that causes Fusarium ear rot. These natural toxins have the potential to cause lethal diseases of horses and swine (the diseases are equine luekoencephalomalacia and porcine pulmonary edema, respectively). 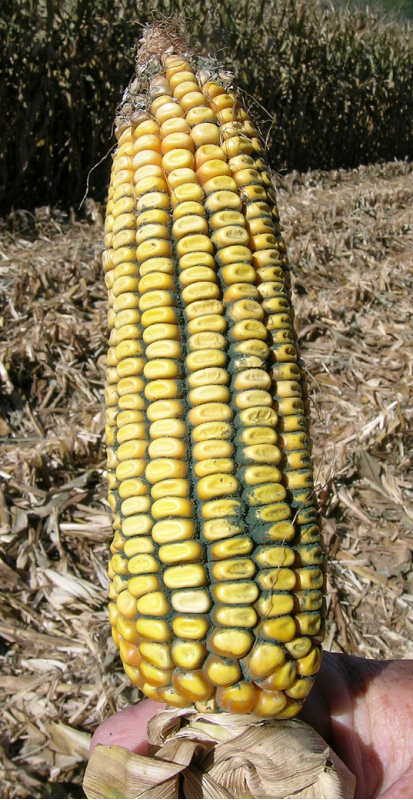 Pre-harvest contamination of corn by fumonisins is most often associated with drought stress at the silking stage, a stress that occurred widely in Kentucky and beyond. Aflatoxins are potent, naturally occurring toxins that sometimes develop in corn and certain other crops. 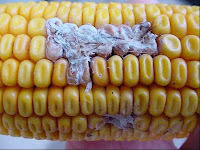 Aflatoxins are also among the most carcinogenic substances known. There are well-defined limits on how much aflatoxin is allowable in corn, based on the intended end use. For example, corn intended for human consumption must have less than 20 ppb (parts-per-billion!). More information on aflatoxin can be found in the UK Extension publication, Aflatoxins in Corn, ID-59, at http://www.ca.uky.edu/agc/pubs/id/id59/id59.pdf. Cutting soybeans for Forage? Consider some Insects! Doug Johnson and Lee Townsend, Extension Entomologists. Margined blister beete on soybean. Some folks have been asking about cutting soybeans to be baled and used for forage. In general most insects in soybean are not a problem. However, blister beetles can be. 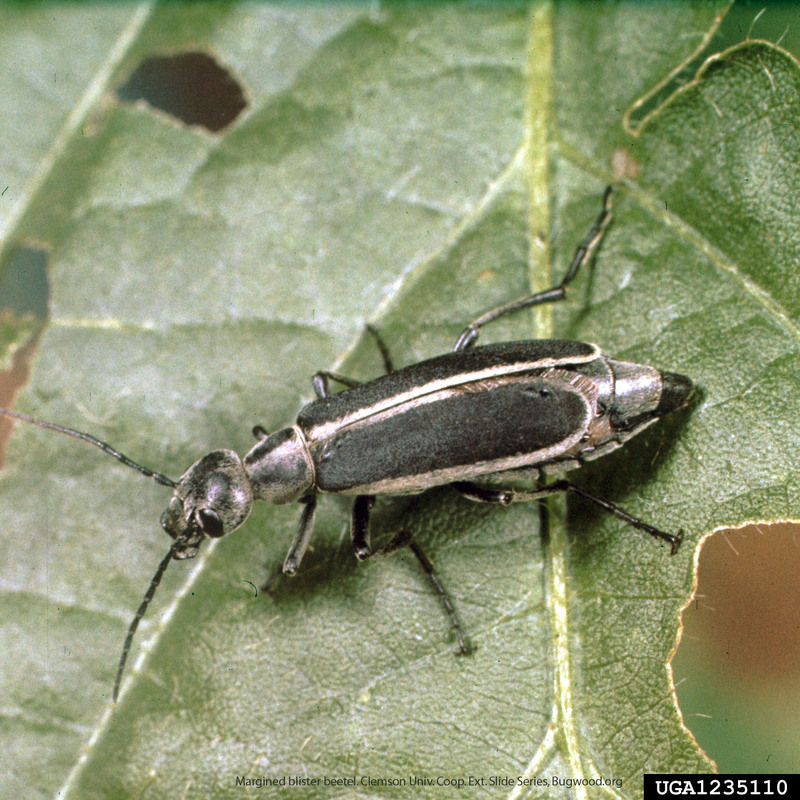 Blister beetles are commonly found in soybeans thought not in large numbers. In my plots this year the black margined blister beetle has been the most common, though others will occur. 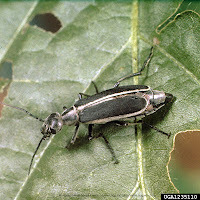 This insect and its close relatives the ash gray and striped blister beetles are infamous as a contaminant of alfalfa hay for their effect on animals, particularly horses. They are found in soybean for the same reason as alfalfa, they are attracted to and feed on blooming weeds. Soybean Rust Probably Here, But So What? 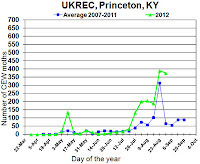 Spores of the soybean rust pathogen were probably depostited in west Kentucky this weekend as a result of Hurricane Isaac's passing through. Moreover, the weather conditions this weekend were perfect for infection. Now that spores of the SBR fungus have been deposited and infection has likely taken place at some level, it will take approximately 3 weeks for us to find SBR pustules. However, significant disease development will not occur until about 4-6 weeks after spore deposition. This means we will probably find SBR in Kentucky before the end of September, but the disease will not build-up much until October. By that time, some fields will have already been harvested, many will be near harvest, and even the latest planted doublecrop fields will be well past the point where damage is possible. So, while it is noteworthy and interesting that SBR is probably already here, it is a matter of “too little, too late” to be of any real concern. Green Cloverworms Appearing in Large Numbers in Soybeans. There are some unusually large populations of green cloverworms on soybeans scattered around the state. This is a very common insect in soybeans which always has the potential for economic damage, but very rarely causes economic damage. The populations I have seen thus far are not at the economic threshold, but were much larger than I am used to seeing. 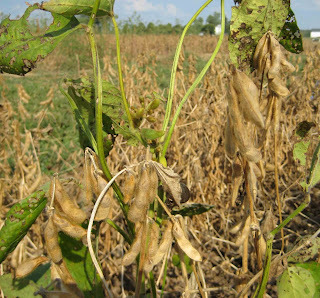 It makes sense to look at your soybeans, especially late planted or slow developing beans. Green cloverworm caterpillar on soybean stem. Green cloverworm is easy to find and easy to identify. These worms are light green with two thin white stripes along each side of the body. When fully grown, these slender worms are 1” to 1-1/2“ long. They have only three pair of prologs in the center of their body. 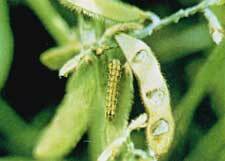 Most of the other caterpillars in KY grown soybeans have either 4 or 2 pair of prolegs. 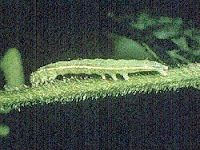 Green cloverworm will become very active, wiggling and looping when disturbed. These pests are foliage feeders. They will strip the leaf tissue from between the veins leaving the veins, petioles and stems behind like a skeleton. These insects are not very hard to kill. It is most important to detect them before they reach threshold and determine if control is needed. If you find them only after the damage has been done, you can kill them, but you can’t put the foliage back on the plants!